Since this site is called "Snack Girl", I get a bunch of questions about crackers. Frankly, I am pretty lost in the cracker aisle myself. What if you never entered the cracker aisle in the supermarket again? Put on your apron, rev up your oven, and try to MAKE crackers. The amazing thing is that they are super easy to make, especially if you own a food processor. I have been pushing food processors for a while because I think they are SO helpful in cutting time from cooking. Mine is a Cuisinart and has been working for 7 plus years - and the bowl fits in my dishwasher. I made these crackers and they were gone as soon as they were cool enough to eat. This is a basic recipe that needs no embellishment unless you like flavored crackers. Like black pepper? Add some cracked black peppercorns. Like salt? Add some Kosher salt to the top right before baking. Like cheese? Grate some parmesan over your ready to go into the oven product or mix some in the dough. Treat this recipe like a CANVAS for your favorite flavors. Look, ma, I'm creatin'! These crackers are better than any store bought brand because they taste REALLY good and you made them. Take THAT Nabisco. Do you make crackers? Please share your tips. Preheat oven to 400 F. Line a baking sheet with parchment paper or dust with all-purpose flour. Put all the ingredients except the water into a food processor and pulse until combined. If you don't own a food processor, mix the ingredients by hand in a bowl until little balls form. Add the water and keep running the machine (or mixing in a bowl) until the mixture forms a ball (add a teaspoon of water at a time until you have a dough ball). Dust your counter with flour and roll out the dough until it is 1/4 inch thick. Transfer to the baking sheet, add any additional spices, and cut into 24 pieces. A pizza cutter is a very helpful tool for cutting the dough. Bake until lightly browned, about 15 minutes. Store in a container at room temperature for a few days (if they last that long). Is the all purpose flour necessary for the final product? For some reason I don't seem to have anything but whole wheat in the house. I blame Christmas. Thanks, as always, for all of these très cool ideas! Lisa you finally made the same crackers- wheat thins that I have been wanting to make! I guess I just haven't stopped to think and pick up a sack of whole wheat flour so I could try it. but your crackers look nummy! These look great and economical, but are they really 1 point PER cracker?? That could add up very quickly! how can we make these crackers lowfat? I can't wait to try these. I am not sure, but you may be able to substitute 1/4 c oats for the white flour Courtney. I usually substitute oats for all bread recipes calling for white flour and since it will be mixed in the food processor, it probably wouldn't affect the texture. Worth a try! These look wonderful! I think I'm going to make these, but add a little ground flax to them for an extra protein boost. @Courtney - you can use all WW flour but they will be a bit crunchier than mine. The 1/2 all purpose gives a nice mouth feel. @Jayne - I tried making these without the butter and olive oil and they were TERRIBLE (like cardboard). They will add up quickly if you eat a bunch. Water crackers are the best if you just need a cracker that is low-fat. I will keep working on it. Would Almond Flour or another grain-less flour work? @Charlie - I have no idea - but I will give it a try! Thanks for the suggestion. Any recipes or ideas on making Graham crackers? My son loves them, but I hate buying them. Is 1 cracker really 1 WW point? That's ridiculous if so. I like your recipes but this one needs some work. 37 calories each cracker and 57 mg sodium each is really high. Not the type of snack I'm looking for. Are you sure your numbers are right? Thanks for this post! 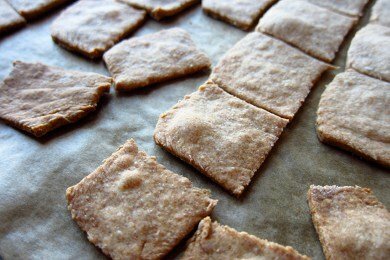 Alton brown gives advice and a recipe for crackers in his baking cookbook but I never felt motivated to try it. I think my boys would like these! Could you add cheese to these...in the mix i mean. My kids love cheese thins/ crackers but its expensive in the amounts they eat them (so i dont buy them now)?